This stack of stainless steel spring bracelets adds polish and interest to your everyday looks—and we mean EVERY day. The flexible bands roll on without pinching skin and are good to be worn all day, day in and out—even while you’re exercising, in the water, or in bed. I love them, got lots of compliments... fun and easy to wear! I’m so pleased with these darling lightweight bracelets. Easy on, easy of. I barely know they are on my wrists. BFF’s Laura Bascomb-Werth and Mary Presutti both wore spring bracelets when they were younger. When the lifelong friends couldn’t find a more polished grown-up version, they started making their own—and named their company Emerson & Oliver, after their own kids. 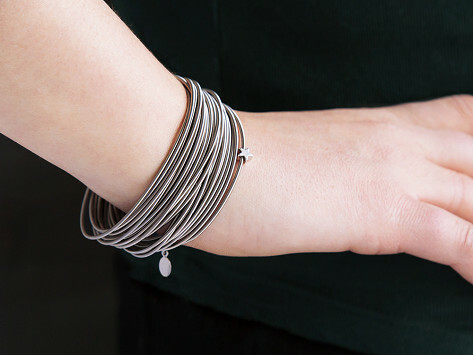 Their stainless-steel spring bracelets are lightweight, flexible, and built to be worn anywhere and every day. The bracelets can handle workouts and dips in the pool (or ocean!) without rusting or tarnishing. And they feel comfortable (no pinching, thank you) so you might not even notice they’re on when you’re in bed. 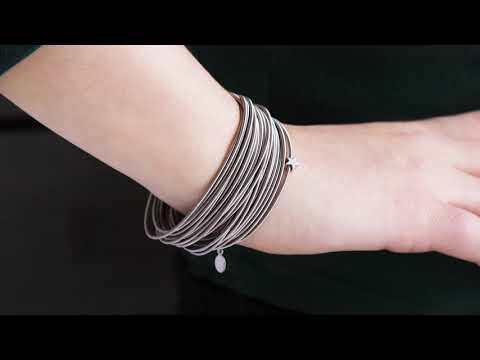 The bracelets roll on, and if one comes un-sprung, no big deal—you can easily re-twist it to get it back into action. Laura and Mary appreciate the struggle to balance work and family, so the duo enlists stay-at-home parents in Rochester, New York to hand-twist the bracelets. It’s a job the parents can do while home with their kids and still earn an income.